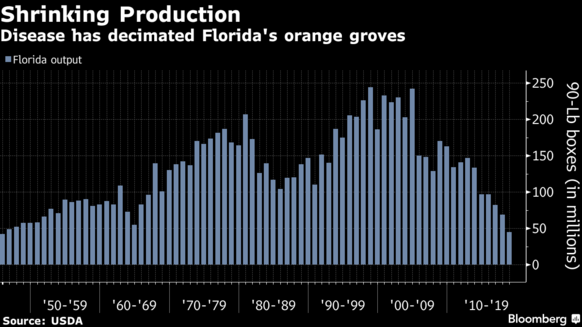 After enduring pestilence and a deadly hurricane, Florida's orange growers are finally catching a break. In the season that starts Oct. 1, the state may reap 70 million boxes of the fruit, according to the average estimate of four traders and analysts in a Bloomberg survey. That compares with 44.95 million the prior year, the smallest crop since 1945, government data show. The survey response range was 65 million to 80 million. Orange production in Florida, the No. 1 U.S. grower, has been dwindling for years thanks to the scourge of the Asian citrus psyllid, a tiny winged insect that spreads the bacterial disease known as citrus greening. Greening has decimated groves and increased costs for crop maintenance. Last year, the industry also suffered a blow from Hurricane Irma after the storm smashed into trees in September and damaged fruit. Orange juice futures have jumped 17 percent over the past 12 months to about $1.59 a pound in New York trading. The crop is finally getting a bit of a lift after better weather and as more growers develop methods to fight the greening disease. Output of 70 million boxes would be the biggest in three years, data from the U.S. Department of Agriculture show. The agency will issue its first estimate for the upcoming season on Oct. 11. A box weighs 90 pounds, or 41 kilograms. "A lot of trees are looking very good -- things are kind of turning around," Ray Royce, executive director at Highlands County Citrus Growers Association, said from Sebring City, Florida. "The leaves have good structure and growers are working on the nutrition of trees" to counter greening, he said. Members of the group, which accounts for about 13 percent of the state's output, will probably collect as much as 9 million boxes in the upcoming season, Royce estimates. That compares with 5.5 million a year earlier. The battle with greening has increased costs at a time when American demand for orange juice is on the decline. Growers are probably spending about $2,100 per acre today, up from $700 10 to 12 years ago, according to Ellis Hunt Jr., the president of Hunt Brothers Cooperative, based in Lake Wales, Florida. "There's really no choice because if you don't spend the extra money and give them more care quicker, then you're going to lose the whole grove," Hunt said. Even as Florida's crop rebounds, falling production in Brazil could help to support prices amid low global stockpiles, said Andres Padilla, an analyst for Rabobank International in Sao Paulo. Poor crops last year reduced world inventories by 22 percent from a year earlier to 365,168 metric tons, the second-lowest since 1991, USDA data show. "We are cautiously optimistic," said Royce of Florida's Highlands County group. "The downside is the decade-long impact of greening that's not going away." The disease "has had a psychological toll on part-time or absentee growers, who left the industry, and a lot of trees went off line," he said. "Still, whatever fruit is out there, we are able to sell at good prices."